The midstream MLP made three crucial moves to get the capital it needed to fund its ambitious growth plan. Energy Transfer Partners' (NYSE:ETP) units have been very volatile this year, slumping more than 40% at the onset before recovering that plunge and then some. The reason for the initial fall and subsequent recovery boils down to concerns regarding the company's ability to fund its growth projects, which it has addressed through three strategic moves. While Energy Transfer Partners announced this deal late last year, it did not close the drop-down of its remaining wholesale fuel and retail marketing assets to Sunoco LP (NYSE:SUN) until the end of March. Still, getting the deal done at a time when the oil market was in turmoil was a big win. What made this such a crucial move is that Sunoco LP paid Energy Transfer Partners $2.2 billion in cash for these assets, as well as 5.7 million of its units valued at $194 million. That cash component was vital in the near term because Energy Transfer Partners is in the midst of constructing an ambitious $15.8 billion in growth projects and needs money to fund its share of the costs. Energy Transfer Partners estimates that this transaction reduced the remaining equity requirements for its 2016 capital expenditures plan to a modest amount. That allowed it to focus its efforts elsewhere. One area of concentration was obtaining funding for its Bakken Pipeline joint venture, which is a partnership with affiliated MLP Sunoco Logistics Partners (NYSE:SXL) and refiner Phillips 66 (NYSE:PSX). Those efforts resulted in the company's announcing that it secured a $2.5 billion project financing facility in August. That facility will provide substantially all of the remaining capital necessary to complete the joint venture's two growth projects, which in aggregate will cost $3.8 billion. The project's financing covers the Dakota Access Pipeline, which is a new 470,000 barrel per day oil pipeline from North Dakota's Bakken shale to market centers in the Midwest. Furthermore, it also covers the interconnection and the trunkline conversion of the existing Energy Transfer Crude Oil Pipeline, which will take crude from the Midwest to the Gulf Coast. This is an important project -- not only for producers in the Bakken, but for Energy Transfer Partners because shippers signed up for long-term, fee-based capacity contracts. As a result, the project will fuel a significant supply of steady cash flow to Energy Transfer Partners once it goes into service later this year. Concurrent with securing the project-level financing, Energy Transfer Partners and Sunoco Logistic Partners sold a 36.75% minority stake in the joint venture to an entity owned by MLP Enbridge Energy Partners (NYSE:EEP) and refiner Marathon Petroleum (NYSE:MPC) for $2 billion in cash. Energy Transfer Partners will receive about $1.2 billion of that cash, with the other $800 million going to Sunoco Logistics Partners. That capital will enable both companies to pay down debt and fund their current slate of growth projects. This move is crucial for several other reasons. First, it reduces Energy Transfer Partners' total capex requirements for that pipeline down to a much more manageable $2.1 billion. Second, it reduces its exposure to risk on this particular project, which is substantial, given the current construction delays due to protests from environmental and Native American groups. Finally, it brings on another critical refining partner in Marathon Petroleum, which -- like Phillips 66 -- agreed to make a long-term volume commitment on the pipeline to support its refineries. That incremental volume commitment improves the overall economics of the project for all partners by bringing the pipeline closer to its maximum capacity. Faced with funding a gargantuan growth budget, Energy Transfer Equity got to work this year to secure financing for its projects. Despite a turbulent market, the company was able to bring in billions of dollars in cash to fund the bulk of its capital needs. Doing so alleviated most of the pressure that weighed on units to start the year and put it in a solid position to deliver growth in the years ahead. 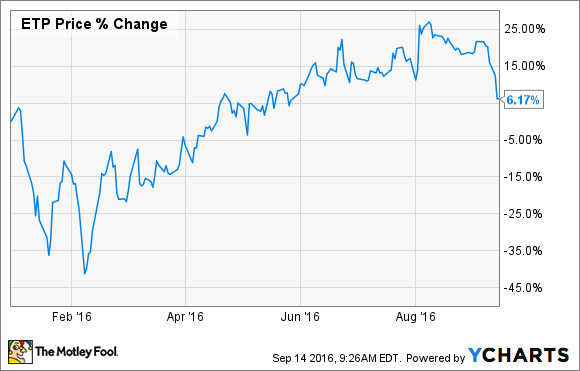 Sunoco Logistics Partners: Is Wall Street Wrong to Hate This High-Yield Dividend Stock?